And perhaps the Bulls will also, at least the use of Jimmy Butler, who returned from missing two weeks and the first two games of the regular season with a sprained thumb to save the Bulls from frosted ignominy in chilly Minneapolis with a game high 24 points, including 11 of 15 from the free throw line. The last two came with 0.2 left in the game with the Bulls trailing by one point. The Timberwolves tried a tip play in vain as the game ended. “What a way to kick off the season,” said Butler in his first appearance. “I’m happy we got the W. They are hard to come by. On to the next one. It may have been a bit of good fortune as well for the Bulls as usually when a player slips, it’s almost automatically called traveling. Minnesota coach Flip Saunders was immediately up signaling traveling as Butler went down, quickly gathered himself and then faked Wiggins into the air. It comes a day after the Bulls were grousing about officiating in the loss to Cleveland that went against the Bulls. “I thought it was a travel,” said Saunders. “It’s pretty tough to catch the ball, take two and a half steps, fall to the floor and then all of a sudden get back up. But that’s the way it goes. They made the plays. They’re a veteran team. I’m not sure the NBA quite views the rules that way. But there’s always been in the NBA a belief and direction that the aggressor gets the benefit of the doubt. It’s not so much Michael Jordan, as the Bulls were accused in the 1990s, or LeBron James now gets the calls. It’s that they were more energetic, more the provocateur. Much like in life. If you sit back and wait for success, it generally dunks over you. So perhaps the Bulls still need to get to the level of the Cavs because of LeBron James, and especially because Derrick Rose missed the latter part of Friday’s loss. 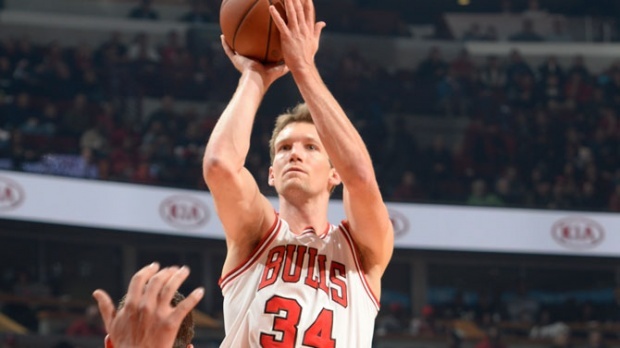 He sat out Saturday as a precaution and is expected to play when the Bulls host Orlando Tuesday. But this Bulls team is being regarded in that category of one you have to meet with force or surrender. The Bulls certainly expect to be doing so. And they could or should with performances like they received from Butler, and especially once Rose returns. The duo hasn’t played together yet and is looking like they could be one of the premier backcourts in the NBA with Rose’s explosive scoring abilities and Butler’s aggressive play. It should come Tuesday as Rose warmed up before Saturday’s game and then decided it wasn’t worth taking the chance after spraining his left ankle against the Cavs Friday before halftime. Taj Gibson also sprained his ankle in Friday’s game. It was more severe and he was declared out before the game and remains uncertain for Tuesday. So it was left to Butler to return from his injury sustained two weeks ago and just in time. Butler also had just come off a long negotiation with the Bulls about a potential contract extension that didn’t get done. But Butler reiterated he intends to eventually sign with the Bulls. They cannot negotiate again until next July. Butler then did some adjudicating of prized rookie Wiggins early in the game, going into the post against the weaker Wiggins to draw fouls and get to the basket. It helped the Bulls take a 63-49 halftime lead that they basically rode until Minnesota made it a game by drawing within one point with eight minutes left in the game. From there it was a pitched competition that concluded in the most unexpected way as the Bulls, again outrebounded and dominated on the offensive boards—42-38 overall and 13-5 offensive—failed to grab three missed shots in the last 15 seconds. A Mo Williams three bounced long left and Butler didn’t box out Martin. Martin’s baseline jumper came off to Tony Snell. But Nikola Pekovic grabbed it away and went up, denied by Joakim Noah. The ball was then tipped back on top to Williams. Butler ran at him, leaving Martin alone in the left corner and he made the three for a 105-104 Minnesota lead. And then it was the Jimmy. Jimmy doesn’t like losing. Jimmy likes the spotlight now. Jimmy’s ready. The Bulls ran an inbounds play for a Butler winner in preseason. And this one was similar with Kirk Hinrich making the inbounds pass. Butler came up from the right block over screens from Pau Gasol and Noah, the last one sealing off the athletic Wiggins. Butler caught the ball on the run turning left above the three point circle. Instead of pulling up like last time, he began to drive the left side. But he slipped down at the free throw line extended on the left side. He immediately got up as Wiggins now caught him. Butler pump faked. Wiggins already had two blocks, including a terrific one outside on Hinrich. There was nothing there this time as Butler held the ball, took the contact and then shot and fell. The Minnesota bench erupted with traveling sign language. But the officials whistled only for the foul. Butler swished both and the Bulls were 2-1 and heading for five consecutive games against the poorest teams in the Eastern Conference. “He was great throughout the game,” Bulls coach Tom Thibodeau said of Butler. “He’s doing everything; he is guarding, he is scoring, he is making tough plays. He guards everyone, he is physical, he doesn’t say boo. He works hard, he plays for the team and he plays to win. He played a great game. He has big time toughness. It was another aberration of sorts, though this is a new Bulls team. Addressing the offensive deficiencies was a major off season priority. Mission accomplished. Now if they can get back to that defense and rebounding as well. Though at 2-1, there’s plenty of time. Gasol had another good game with 20 points and Mike Dunleavy had 13 points and a trio of three pointers. Though there’s been discussion Dunleavy should work more with the reserves to enable rookie Doug McDermott to get going, Dunleavy has been proving his value with the starters. McDermott had a rough time again shooting one of four. But he played only about 11 minutes. This time off the bench the surprise was rookie Nikola Mirotic, who had 12 points and eight rebounds, though was scoreless after halftime when the Timberwolves adjusted and put a smaller, quicker player on him. But it was Mirotic and Aaron Brooks who played crucial roles in the second quarter in giving the Bulls enough margin to withstand a better Minnesota game after halftime. Brooks had 10 of his 16 points in the second quarter. Combined, he and Mirotic scored 22 of the Bulls 36 second quarter points and each made a pair of three pointers. Mirotic, who was too quick, took advantage of the Timberwolves trying to match him in size with Gorgui Dieng. Mirotic drove, passed well and then was able to have space for his threes and looked impressive. After halftime, Minnesota went with the quicker Robbie Hummel and Mirotic was scoreless. He’ll have to adjust as once the NBA gets a book on your moves, you need to write some of your own new chapters. Butler then returned late in the third quarter and scored on a pair of inside plays against Wiggins, who was no match for the 30th draft pick in 2011. That second quarter which the Bulls dominated also raised some intriguing questions about another issue hanging over the season, the pairing of Noah and Gasol. Noah finished with eight points and 11 rebounds. He had two blocks and Pau added four more after six Friday. But Noah in moving to center seemed much more involved in the second quarter playing with Mirotic, who stretched the floor with his size and shooting. Noah was four of seven overall, but three of three playing without Pau and got two of his three assists playing with Mirotic. “When paired together, Gasol takes the center position because he is not quick or agile enough to defend outside. Plus, he’s a superior interior offensive player. But the Timberwolves came right out making Noah chase outside against their stretch forward, Thaddeus Young, who was hurt later and left the game after a collision with Butler. It cannot be easy on Noah having to chase on defense with his knee issues from offseason surgery. But Gasol cannot defend that way at all. Thibodeau has been mixing and matching the three big men when Gibson has played with Noah at power forward to start games and then moving inside once Gibson comes in. But Noah goes back outside to start the second half as well and his playing time is generally closely monitored. Would he be better with Mirotic and Gibson with Gasol? Would there be enough minutes for four big men? Though a larger issue is how you ask the reigning Defensive Player of the Year and all-NBA first team center to now become a backup. Sure, there’s the leave your ego at the door thing and all in this to win. But it’s just not done. I wouldn’t be able to do it if I were Thibodeau, either. Though it could be one reason for the rebounding issues that have developed. Gasol isn’t a physical defensive player, relying on his size and athletic ability for blocks and defensive rebounds. The Bulls thus have had trouble keeping opponents off the offensive boards. It’s made more difficult with Noah chasing stretch fours outside. The Timberwolves got right back in the game after halftime as Noah was forced to chase Anthony Bennett, playing for Young, and last year’s No. 1 overall pick who looked good shooting and had 12 points. It was an 18-6 run to open the third quarter with Ricky Rubio piling up assists on the way to a career high 17 and getting in the way for steals and deflections. The Bulls again were careless with the ball and committed 17 turnovers for 23 points. They are averaging 22 points by opponents on their turnovers through three games. Butler and Hinrich, the latter with another good game with 11 points, combined to push the Bulls ahead. Brooks then in for Hinrich got a driving three-point play accompanied with a fist pump to go up 82-76. But the young Timberwolves kept barking back thanks to Martin’s clever play and 11 for 11 on free throws. The Bulls led 85-81 after three and it was a grind throughout the fourth with a Dunleavy three and then finally getting the ball into Gasol enough times led to a pair of jumpers and two trips to the free throw line. Until Butler turned out to be the answer.